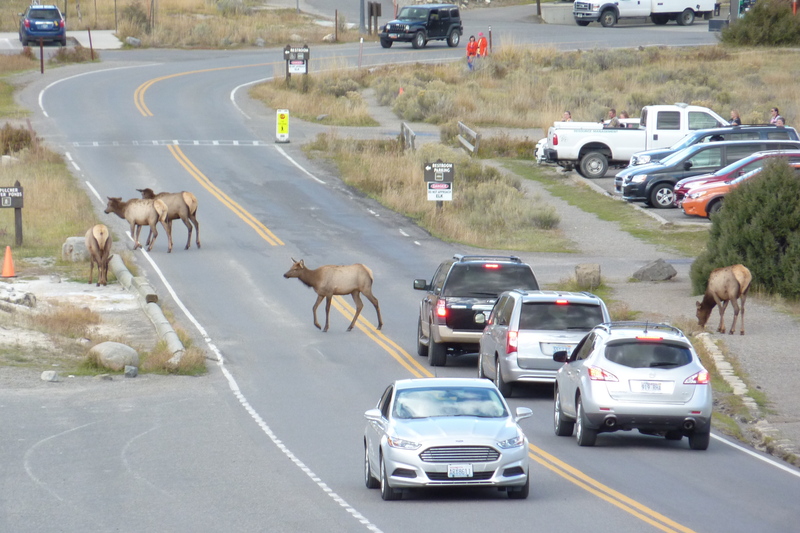 Day 2 of Yellowstone and we have a bit of a traffic jam. Not only are cars stopping on both sides of the road to allow wildlife photography, but the animals oblige by stepping right up to the roadside to make it easier for us to get their close-ups. This bull elk was expressing a bit of road rage. Some animals even compete for road use. 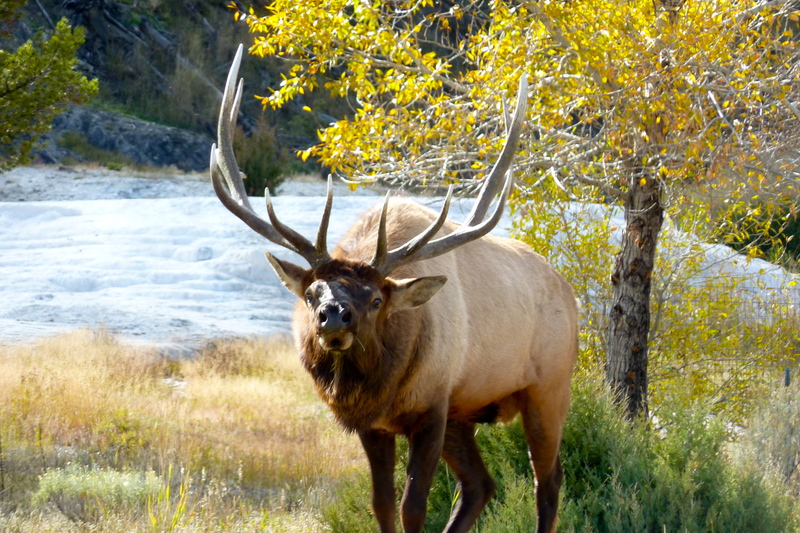 Why does an elk cross the road? To get to Mammoth Springs. 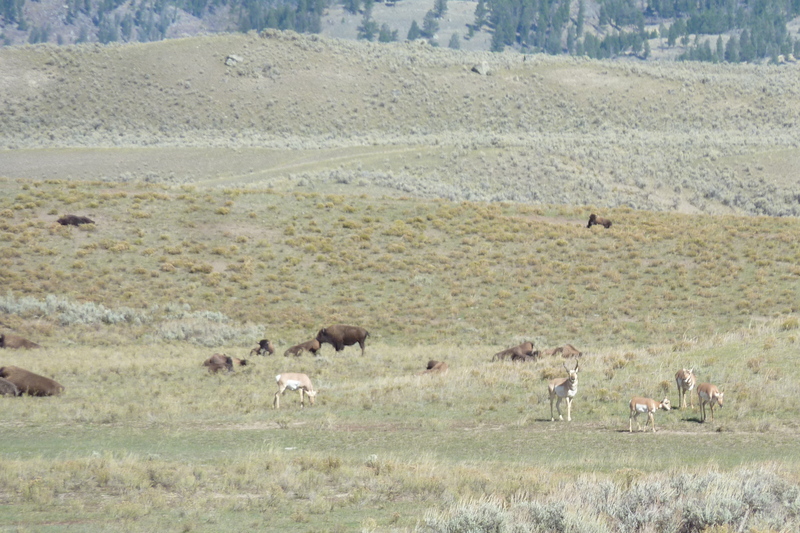 We went to the Lamar Valley, the Serengeti of Yellowstone, known for its abundant wildlife. 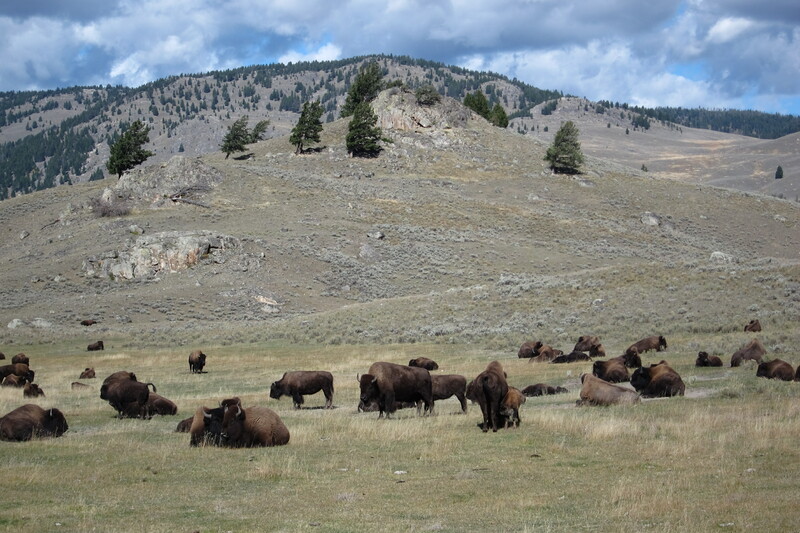 Bison are an everyday sight. Reminds us of a safari from Wild Kingdom. A bit of wildlife symbiosis. 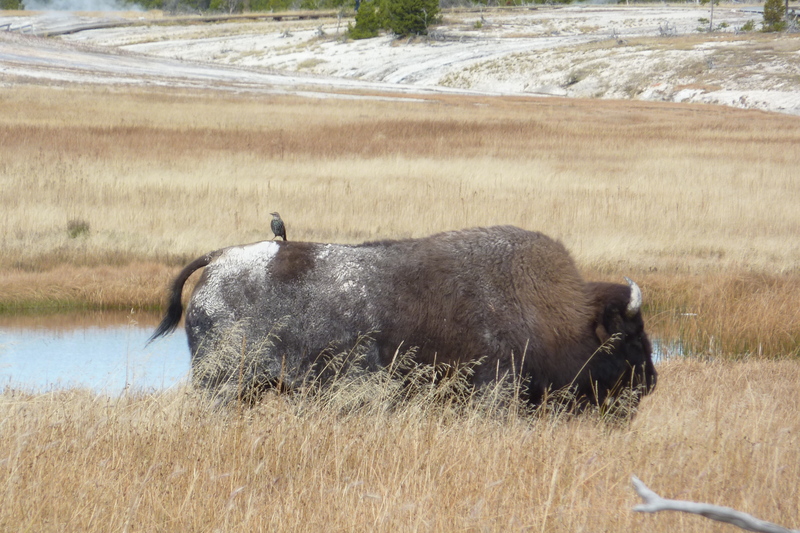 The bird eats bugs off the bison’s back and gets a free ride. 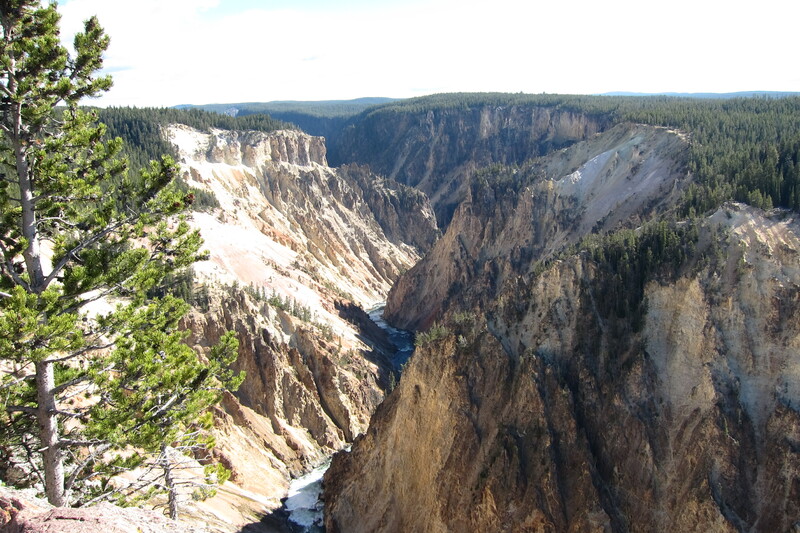 Moving from Lamar to Canyon, we saw that Yellowstone gets its name from its yellow stone. Duh! 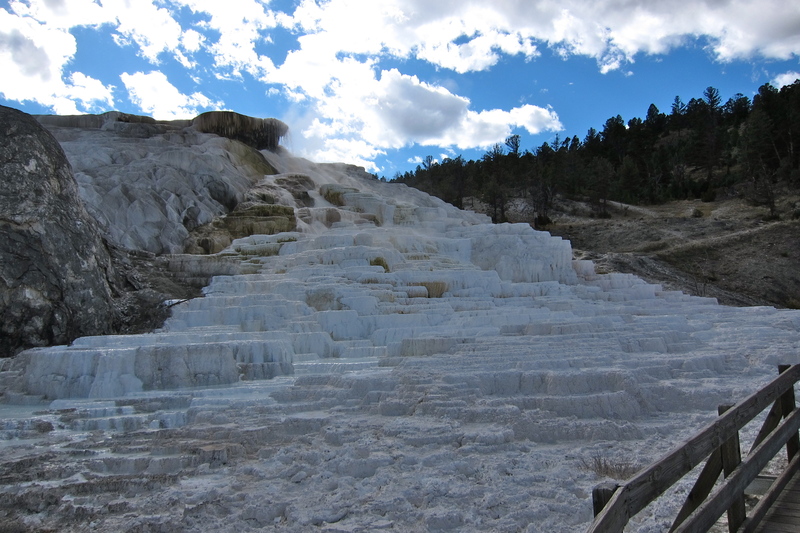 This is caused by the thermophiles, colorful heat-loving organisms that somehow find nutrients in the sulfur-rich waters coming out of the ground nearly everywhere, including the Grand Canyon of the Yellowstone River. More colorful rock near Canyon, Wyoming. The rough ridge circling the top was actually formed by volcanic venting. 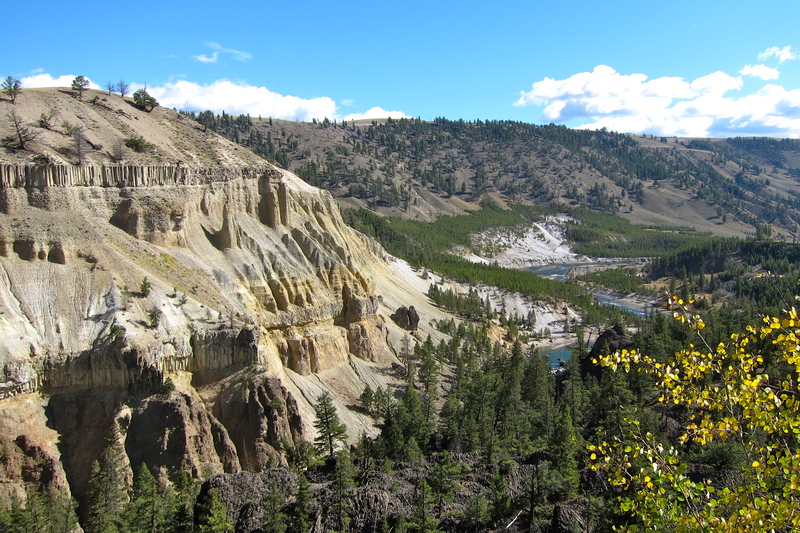 Calcite Springs at the lower end of Yellowstone’s Grand Canyon. 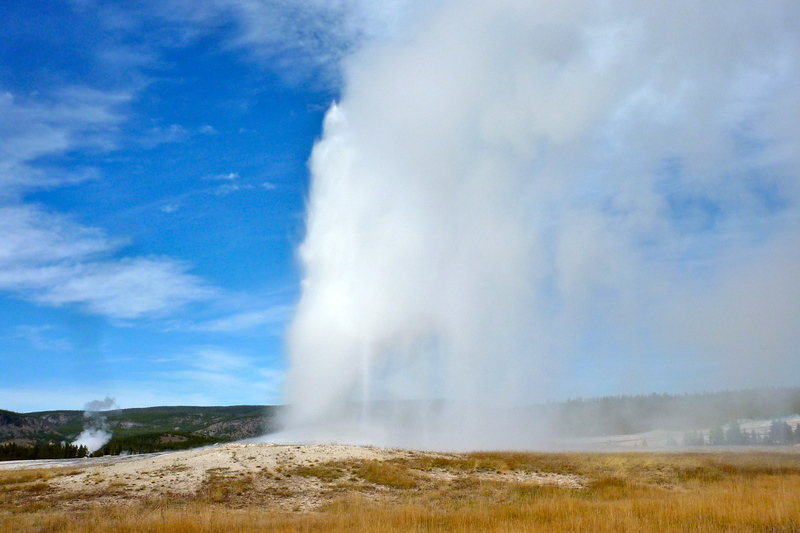 We can’t ignore Old Faithful, which goes off fairly regularly every hour and a half to two hours. Rangers predict the timing, height, and duration based on observations of the most recent eruptions. The park conveniently provides rows of benches for geyser-watchers to wait comfortably and then ooh and aah over the magnificent spectacle. It is grand, although we first watched the eruption of another very active geyser nearby called Grand Geyser. Being here is a bit like Whack-a-Mole; one geyser pops up and dies down and then another pops up in a different spot. There’s no stopping them. Thar she blows. Note another geyser going off in the background at the same time. Many of the 500+ geysers have been named, including Old Tardy, apparently less reliable than desired. Spasm Geyser is one of our favorites. We don’t see anything like this Spasm near Keuka (QKA). Geysers here have their own cult following. We saw an eruption at Great Fountain Geyser. After it stopped, we were about to leave and a bearded man behind us said, “You might want to wait.” How long? “Maybe 15 minutes.” So we waited. Sure enough, the next phase of the eruption came a few minutes later, more spectacular than the last. 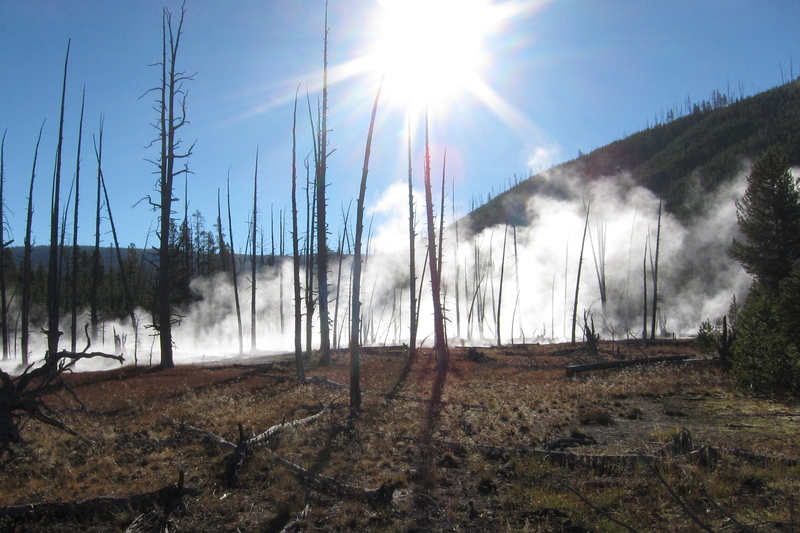 The adage, “Where there’s smoke, there’s fire,” becomes “Where there’s steam, there’s geyser” in Yellowstone. 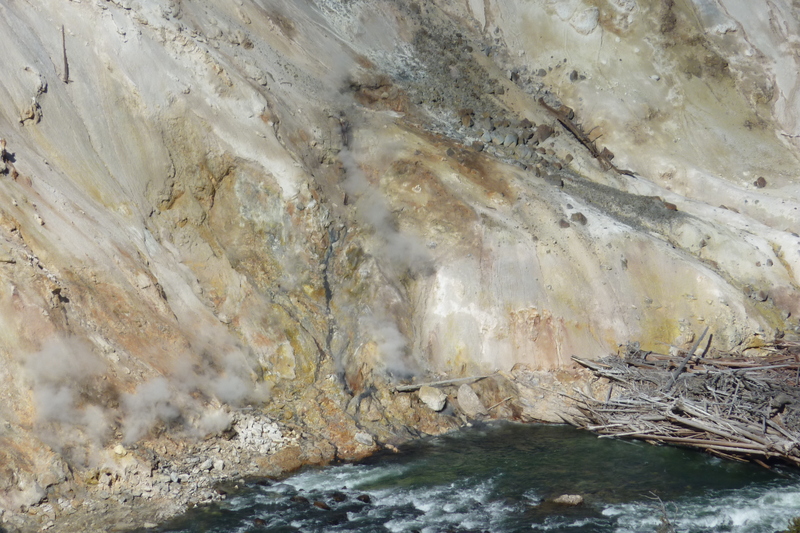 One of over 10,000 thermal features in Yellowstone. Intense surface heat has killed the trees. There have, of course, been real fires in Yellowstone. 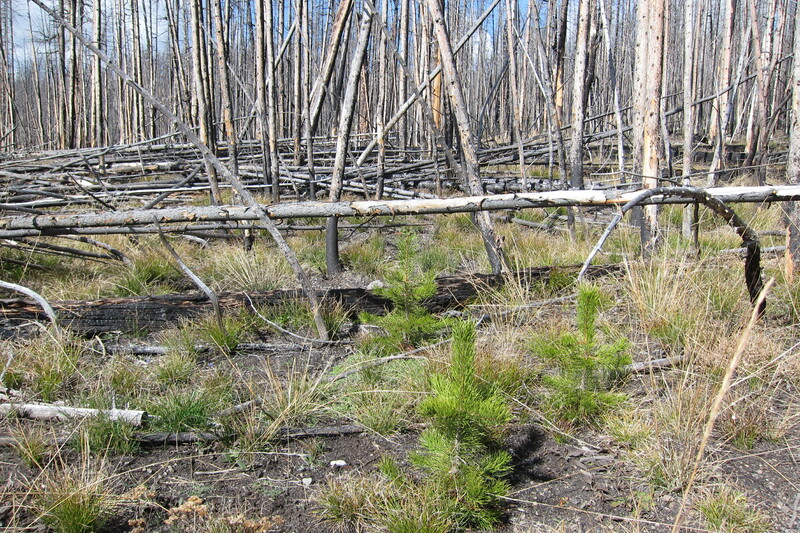 In fact, fire is an important factor in the long-term maintenance of the park’s pine forests. Michael did an ecology report in the fifth grade back in Chelmsford describing the metamorphosis of a forest. Now we’re seeing the process live here in Yellowstone’s massive woodlands. Lodgepole pine trees grow tall and thin, holding their small cones tightly closed. 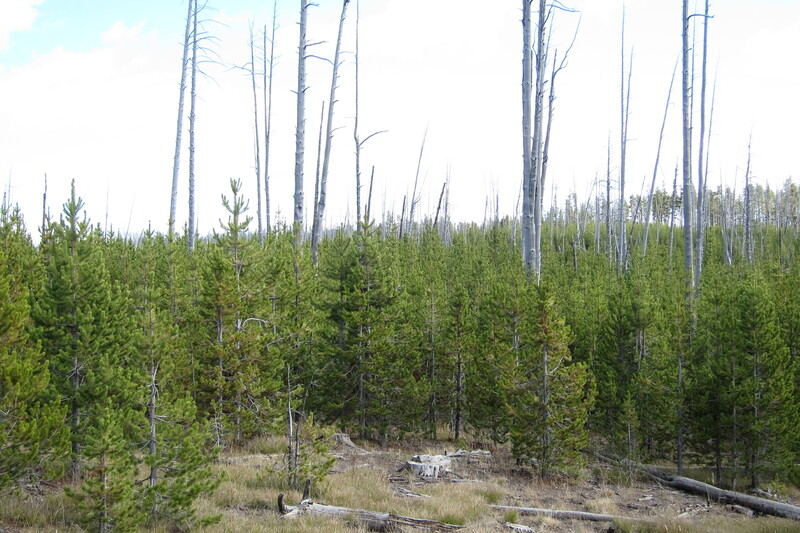 Millions of trees in Yellowstone’s pine forests. But then fire hits and leaves burned trunks scattered like Pick Up Stix on the hillsides. 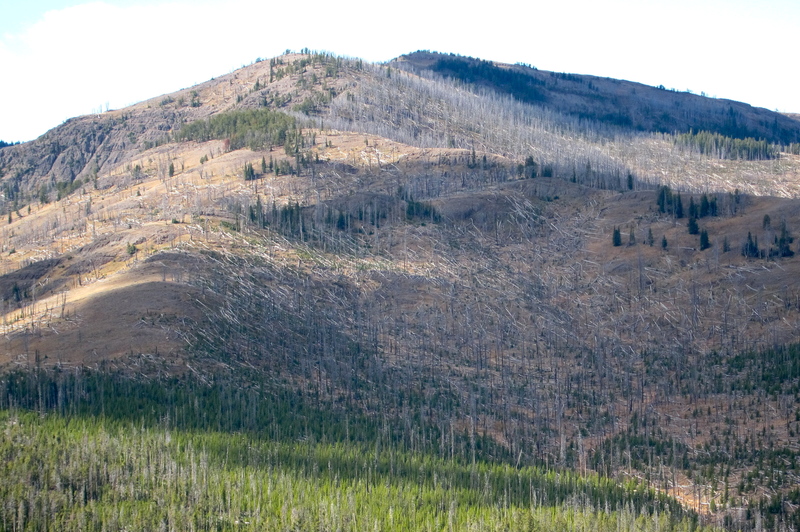 Thousands of lodgepole treetrunks scattered over the hills. Fires are necessary. Without the intense heat, the “serotinous” cones would not open and release seeds. The fire’s carbon-rich ash provides nourishment for new growth. Within a season or two, seedlings sprout up to rebuild the forest. Mammoth Hot Springs is at the very northern end of Yellowstone. Here more thermophiles color the terraced deposits that build from hot water constantly flowing up through the area’s limestone. Elk and a lone bison seem to have made their home here to entertain the tourists or enjoy the warm air. Must be a stunning sight in a snow storm. Terrace after terrace of calcium deposits continuously building at Mammoth’s Palette Spring. 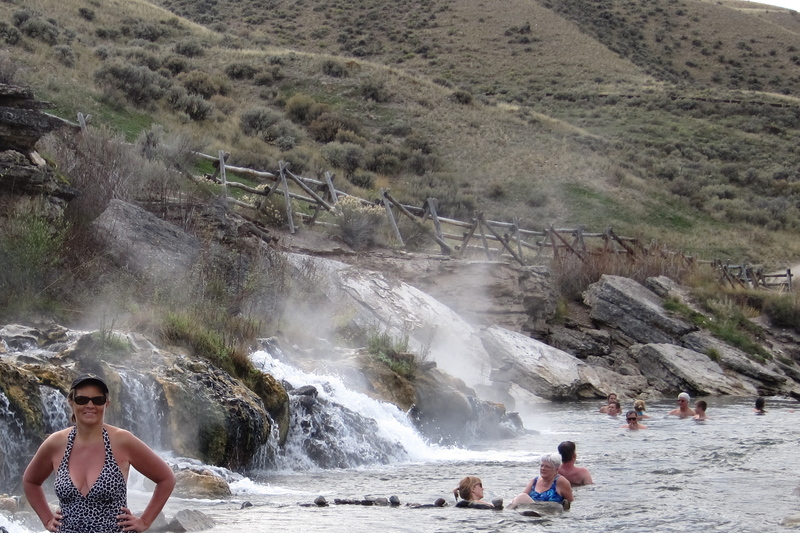 We wondered just how hot the hot spring waters are. Some areas were clearly boiling, so probably over 200 degrees. Do not touch! This isolated thermal pool along a quiet road was probably in the 120 range, hotter than a hot tub, but not quite scalding. Not too hot to touch, but not a good idea to jump in. Our last stop inside the park was Boiling River. A hot spring gushes out of the ground next to the Gardiner River and spills into it for about 20 yards along the river’s shore. People have lined up rocks in the river basin to permit just the right amount of cold river water to mix with the hot spring water to make a natural hot tub. The average temperature was about 85, but 120 on the left and 50 on the right. Nice if you keep rotating. Michael kept looking for the perfect Goldilocks “just right” spot. Really hard to leave…but we must move on. Everyone we’ve spoken to has congratulated us on the unseasonably great weather we’re having this week. It has been truly fantastic. 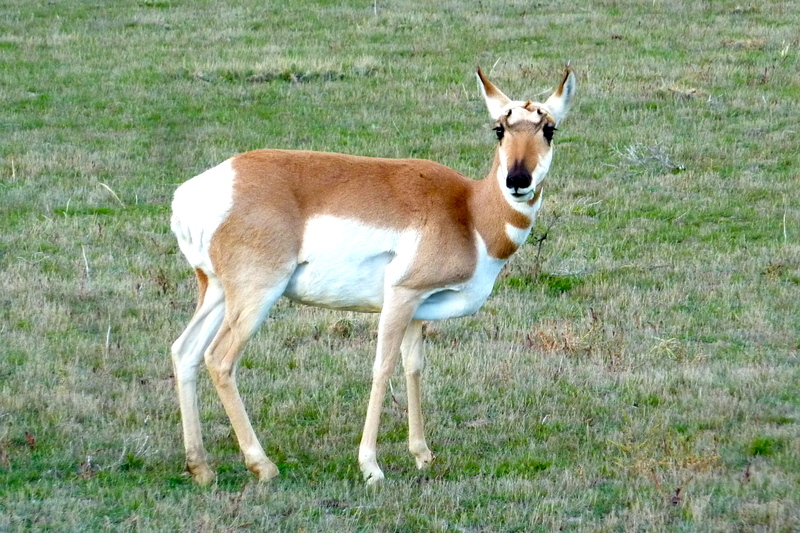 Tomorrow we head to Glacier to enjoy the last few days of this beautiful autumn and look for mountain goats. 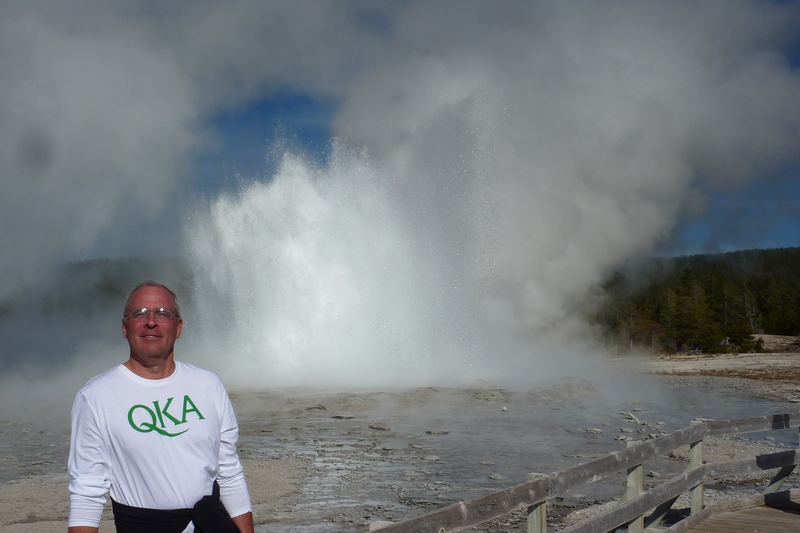 This entry was posted in Travel Journal and tagged bison, Boiling River, elk, geysers, Montana, national park, Old Faithful, river, wildfire, wildlife, Wyoming, Yellowstone. Bookmark the permalink. 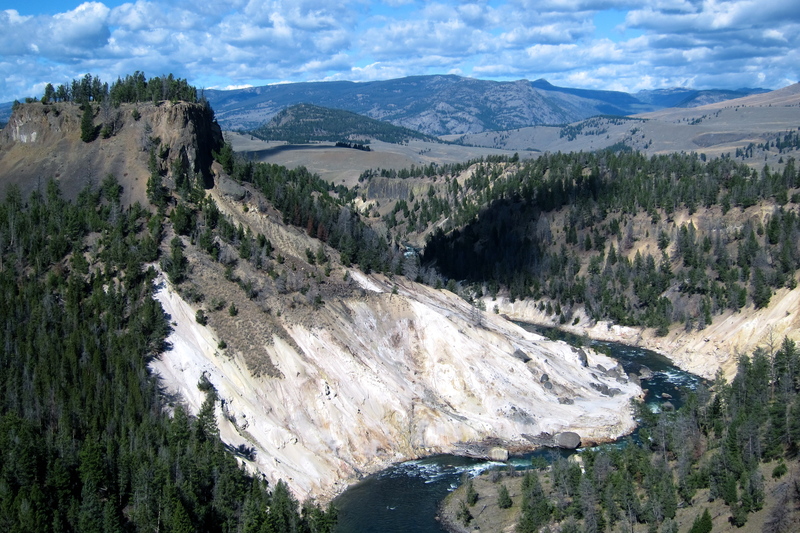 I have just reread your blog on Yellowstone and find it so interesting. Such detail. Michael’s 5th grade teacher would be proud! The swimming(dip in the river) was a great way to end this visit. Thanks for all the details of nature unleashed.